Ana Ramacake hails from Visama in Tailevu. The first opportunity to represent Fiji cans to Ana at the age of 29 in 1963 with the inauguration of the South Pacific Games. In the Games she won 2 gold, 2 silver and 1 bronze medal. In the 1966 South Pacific Games in Noumea, New Caledonia, Ana won 2 gold and 2 silver medals. 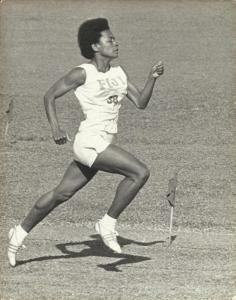 She travelled to Jamaica on her own, without a manager or coach to represent Fiji in the 1966 British Empire Games. The same year she was in New Zealand competing in the New Zealand Championships where she won the gold medal in the long jump of 19′ 3 ¼”, a New Zealand National Record, which was not recognised as Ana was a visitor. At the 1967 National Easter Championships Ana set a national long jump record of 5.93m, which still stands at the time of her induction. At the same meet she set a 200m national, native and all-comers record of 24.6 seconds, which was broken 25 years later. Ana lived in Nadi for may years with her family up until her untimely death in 2014.